A weekly newspaper is celebrating its 200th anniversary with a city centre exhibition. The Lichfield Mercury was first published on 7 July 1815 as a four page edition which was sold for sixpence halfpenny (21/2p). 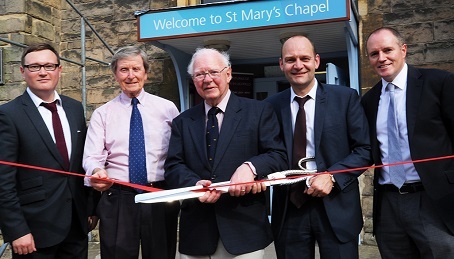 The paper has now set up an exhibition to mark its 200th birthday and has held a special ceremony to open it, which was attended by civic leaders. And in next week’s paper, the first edition of the title will be republished. Mercury staff, from left, reporter Alex Keller, former editor Keith Boughey, Les Ashley, the Mercury’s oldest former employee, group editor Gary Phelps and reporter Andy Kerr are pictured at the opening of the exhibition. Editor Gary Phelps told HTFP: “We have been preparing for the anniversary for a long time, going through our archive and collecting together artefacts from the Mercury’s past to put together an exhibition which we think our readers will enjoy. “From a journalistic viewpoint creating the exhibition has been very interesting, because we started out aiming to tell the Mercury’s story but pretty soon realised we were telling the story of the whole newspaper industry too. The exhibition was officially opened by the oldest former member of Mercury staff Les Ashley, 82, who worked in the production department. It features historic front pages, memorable characters, iconic photographs and unusual artefacts from the Mercury’s past, while also explaining how the digital revolution is shaping the paper’s future. The exhibition has been sponsored by Lichfield business Arthur Price and the first 200 visitors will receive a free collectable ‘2015’ teaspoon. James Amhplett founded the title, which was originally known as the Lichfield Mercury and Midland Chronicle, weeks after the Battle of Waterloo and the first edition carried a full account of the battle. He set up the Mercury’s first offices on Boar Street, now Bore Street, and sold the business in 1821. The title changed hands again before it closed in 1833 and it lay dormant until 1877, when it was revived by printer Frederick Brown at new premises in Bird Street. The second incarnation of the newspaper, which is now owned by Local World, has been published every week since then. The exhibition will be held for two weeks from 4 July at the Dyott Chapel of St Mary’s Heritage Centre in Lichfield. 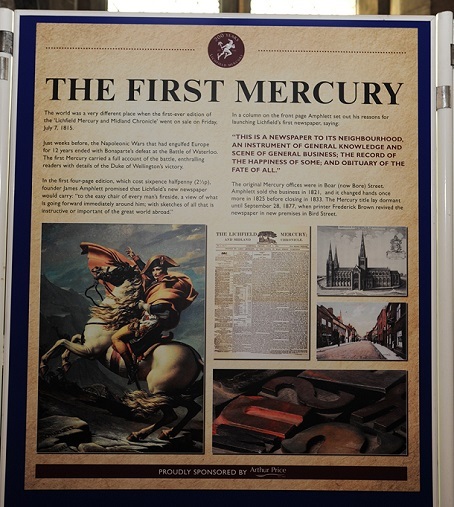 The exhibition includes details about the first edition of the Mercury. Worked there for a year in the 1990s. It’s a much-loved paper. I still remember Kurt Calder as one of the best editors I’ve ever worked for.